Susan Ryder was born in 1944. She studied at the Bryan Shaw School of Painting in London from 1960 - 64. She was elected a member of the New English Art Club in 1980 and to the Royal Society of Portrait Painters in 1992, where she was Vice President from 2002 to 2008. Since the age of 18 she had exhibited regularly in the Royal Academy Summer Exhibition and in many other mixed and group exhibitions. She had three exhibitions at W H Patterson and one solo show at the Oakham gallery. 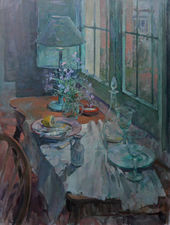 She has now moved to the Panter and Hall Gallery where she will be holding a solo exhibition in 2013. In November 2010 her exhibition, "Antartica to China" was held at Ackermann Modern. Her work can be found at Panter and Hall, the Mall Galleries and Manya Igel Fine Art. Although well known for her portraits and interiors, it was as a landscape painter that Susan Ryder received her first award. Many prizes followed for both her portraits and interiors, with commissions to paint at fine country houses both in the United Kingdom and further afield. Her portrait commissions include a wide range of people, most notably, in 1981, HRH The Princess of Wales in her wedding dress and recently, HM The Queen, to celebrate the Royal Automobile Club's Centenary. In 1999 one of her portraits was chosen to hang in the National Portrait Gallery.